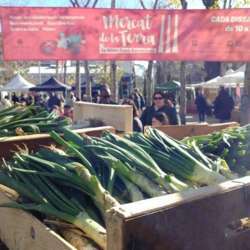 How about a FREE visit to the Food Market "Mercat de la Terra", to taste and buy local food and eat an OPTIONAL mini calçotada there? IF YOU DON'T WANT THE MINI CALÇOTADA DON'T WORRY, COME AND VISIT THE MARKET FOR FREE, AND DON'T PAY ANYTHING. Have you ever tried the calçots? It is a vegetable, like a long onion, which Catalans eat by dunking it in the vegetarian sauce called romesco. We will go to MERCAT DE LA TERRA organized by Slow Food Barcelona. Come on, I hope see you there and enjoy!